In the land of greens & browns, hop along a scenic route 120 km from Cape Town to catch placid stretches of blue occasionally broken by gigantic splashes of white. Hermanus at the heart of Cape Whale coast, has many badges to its credit. 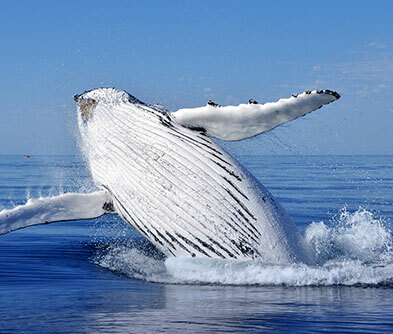 The best land based whale watching destination, the only town with an official whale crier and Southern Right Whales that make it to these waters with Swiss like precision. From June to November, this species, sometimes accompanied by Humpbacks & Killer whales, swarms to Walker Bay to mate and calve and provide homo sapiens a chance to gape at them. 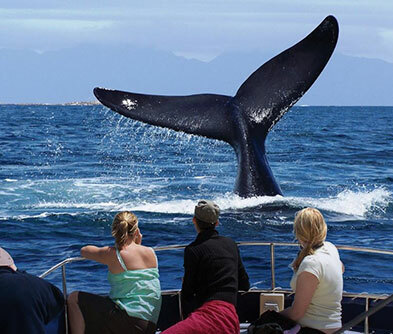 The town cliffs offer a ringside view, while whale cruises take you right up & close. Marine action is not the only attraction. 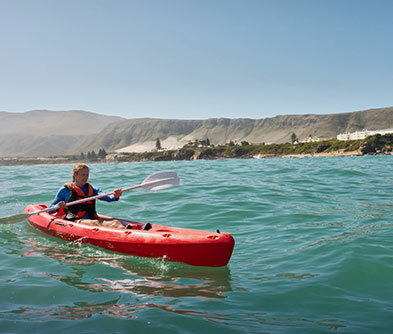 The route to Hermanus abounds with charming wineries, golf courses and unspoilt beaches. The town also hosts the world’s only Enviro-arts festival in September every year, when artists and visitors alike pay homage to the great mammals that grace these shores.